We made a dog treat dispenser which can be controlled over the web, and can also be easily configured to dispense treats through a Google Calender. We 3D Printed the designs after designing them in Solidworks. 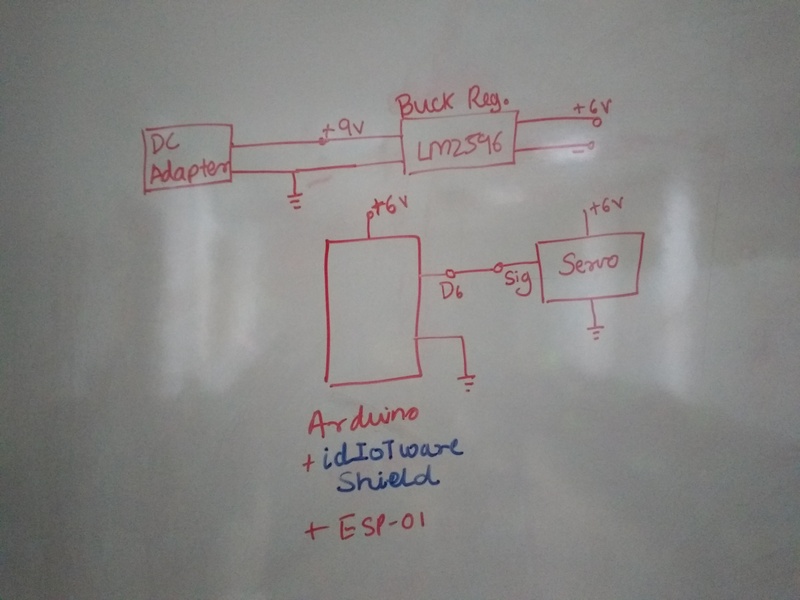 The Arduino Uno with the idIoTware Shield , alongwith the ESP-01, was configured to connect to Blynk. Since the Blynk app currently does not have a servo widget, it made sense to use a Virtual pin to receive a trigger in a function, and then command a servo to move, which opens a slot to let the treats drop in a small container which also was 3d printed. You can also use a button to create a trigger on a virtual pin, which can open and close the servo for a stipulated time. We created our own "Quick and Dirty" app in MIT App Inventor that sent a http get request to our virtual pin when a button is clicked in the app. Using IFTTT, you can tie events from a Google Calender to trigger outbound requests through the Maker Channel. This allows you to create truly automated pet feeding, just by creating a recurring event on a Google Calender. Please post your comments if you have doubts or questions on this project. Please ensure you can find a bottle with 90mm-96 mm opening before you print. Ofcourse, it can be 3D printed.